For other uses, see Fulton Street Line. The IND Fulton Street Line is served by the A and C.
The IND Fulton Street Line is a rapid transit line of the IND Division of the New York City Subway, running from the Cranberry Street Tunnel under the East River through all of central Brooklyn to a terminus in Ozone Park, Queens. The IND Rockaway Line branches from it just east of Rockaway Boulevard. The A train runs express during daytime hours and local at night on the underground portion of the line; it runs local on the elevated portion of the line at all times. The C train runs local on the underground portion of the line at all times except late nights. The line runs primarily along Fulton Street, Pitkin Avenue, and Liberty Avenue. The underground portion, which constitutes the majority of the line, was built for the city-owned Independent Subway System (IND), opening between 1936 and 1956. The elevated portion in Queens was originally part of the Brooklyn–Manhattan Transit Corporation (BMT)'s Fulton Street elevated line; the Elevated in Brooklyn was closed and demolished in stages with the opening of the subway line. Under Fulton Street, the line is mainly single level. Nostrand Avenue is the exception, with the express tracks on the upper level and local tracks on the lower level. During construction, the old, now-demolished BMT Fulton Street Elevated (which the IND line replaced) had to be supported. The stations along Liberty Avenue in Queens, from 80th Street–Hudson Street through Ozone Park–Lefferts Boulevard, as well as the current three-track elevated structure, were built for the elevated Fulton Street Line in 1915 as part of the BMT's portion of the Dual Contracts. This was the only section of the Fulton El that was built specifically to handle steel subway cars, as opposed to lighter wooden elevated cars. Entering Brooklyn via the Cranberry Street Tunnel as a two-track line, the IND Eighth Avenue Line travels east on Cranberry Street, then south on Jay Street. It becomes the Fulton Street Line at an interlocking north of Jay Street–MetroTech while briefly running parallel with the IND Culver Line. It turns away from the Culver Line onto Schermerhorn Street to the six-track Hoyt–Schermerhorn Streets station, which it shares with the Brooklyn–Queens Crosstown Line. The local tracks are unused at Hoyt-Schermerhorn Streets, but connect to the abandoned Court Street station which is now the site of the New York City Transit Museum. At this point, the line becomes a four-track system until Euclid Avenue. The line continues east under Schermerhorn Street to the intersections of Third Avenue and Flatbush Avenue, across them onto Lafayette Avenue and then finally onto Fulton Street until Broadway Junction. After Broadway Junction, the line leaves Fulton Street via Truxton Street, crosses Broadway, curves through a corner of the East New York Yard, crosses Jamaica Avenue and then south on Pennsylvania Avenue. It then turns east onto Pitkin Avenue until Euclid Avenue station. East of Euclid Avenue there are track connections to Pitkin Yard, and from either the express or local tracks to the two-track line towards Grant Avenue station. The four mainline trackways continue east on Pitkin Avenue, disused, and end at approximately Elderts Lane. Past Grant Avenue, the line joins the former Fulton Street elevated via a ramp as it enters Queens, swinging somewhat north until it is over Liberty Avenue. Here, it becomes a three-track line, with the center track coming from Pitkin Yard. Just past Rockaway Boulevard, the IND Rockaway Line branches southward while the Fulton Street Line continues over Liberty Avenue to its terminus at Lefferts Boulevard. The Fulton Street subway was the city-owned Independent System (IND)'s main line from Downtown Brooklyn to southern Queens. Along with the IND Eighth Avenue Line, it was also alternately known as the Washington Heights−East New York Line. The groundbreaking for the line was held on April 16, 1929, at Fulton Street and Arlington Place, near the future Nostrand Avenue station. The line was opened from Jay Street to Rockaway Avenue on April 9, 1936, including the stub terminal at Court Street. To allow the subway line to be built, the following streets were widened from being 60 feet (18 m) wide to being 80 feet (24 m) wide: Jay Street between Nassau Street to Fulton Street, Smith Street between Fulton Street and Atlantic Avenue, and Schermerhorn Street between Smith Street and Nevins Street. The land acquired to widen the streets was valued at $1,750,000. Further construction was delayed by funding problems due to the Great Depression in the 1930s. This was temporarily solved by federal Works Progress Administration funding starting in 1936. The portion continuing from east of Rockaway Avenue along Pennsylvania and Pitkin Avenues to Crystal Street began construction in 1938. The next portion east from Crystal Street to around Grant Avenue, including the Euclid Avenue terminal and the Pitkin Yard, began construction in 1940. The progress lasted only a few years, as all work on the last portions in Brooklyn was stopped by December 1942 shortly after the United States entered World War II, with Broadway−East New York complete but not in operation due to lack of signal equipment, and the remaining stations to Euclid Avenue as unfinished shells. The Court Street station was closed on June 1, 1946 due to low ridership and because of its close proximity to the Hoyt–Schermerhorn Streets station. After World War II ended, workers and materials became available for public use again. The badly needed extension to the more efficient terminal at Broadway−East New York (the current Broadway Junction station) opened on December 30, 1946. The extension of the Fulton Street Line, the completion of which had been delayed due to war priorities, was finished by funds obtained by Mayor William O'Dwyer and was placed in operation on November 28, 1948, running along Pennsylvania Avenue and Pitkin Avenue to Euclid Avenue near the Queens border. Forty additional R10 cars were placed into service for the extension. The cost of the extension was about $46,500,000. It included the construction of the new Pitkin Avenue Storage Yard, which could accommodate 585 subway cars on 40 storage tracks. Because these stations were completed later than the rest of the line, they received different design features than other IND stations, including different wall tiles and fluorescent lighting. The Fulton Street express tracks were not used in regular service until October 24, 1949. A trains began running express during rush hours to Broadway–East New York, with E trains extended to provide local service. The express reduced travel time by five minutes. In 1953, the platforms were lengthened at Ralph Avenue and Broadway–East New York to 660 feet (200 m) to allow E trains to run eleven car trains. The E began running eleven car trains during rush hours on September 8, 1953. The extra train car increased the total carrying capacity by 4,000 passengers. The lengthening project cost $400,000. In late 1952, the Board of Transportation began construction on a connection between the IND and both the Fulton El and the Rockaway Beach Branch of the Long Island Rail Road, which included a new underground station at Grant Avenue. The connection from the 80th Street elevated station to the rest of the BMT Fulton Elevated was severed on April 26, 1956 and the IND was extended east (track direction south) from Euclid Avenue via the intermediate station at Grant Avenue, and a connecting ramp (known as the Grant Avenue ramp). The new service to Lefferts Boulevard began three days later. On June 28, 1956, the connection to the IND Rockaway Line east of Rockaway Boulevard was opened. The 2015–2019 MTA Capital Plan called for the Fulton Street Line's Clinton–Washington Avenues, Kingston–Throop Avenues, and Van Siclen Avenue stations, along with 30 others, to undergo a complete overhaul as part of the Enhanced Station Initiative. Updates would include cellular service, Wi-Fi, USB charging stations, interactive service advisories and maps, improved signage, and improved station lighting.However, in April 2018, it was announced that cost overruns had forced the MTA to reduce the number of subway stations included in the program from 33 stations to 20. The stations to be renovated along the IND Fulton Street Line were among the 13 stations without funding, which will be pushed back to the 2020–2024 Capital Plan. The extension of the IND Fulton Street Line would have included a station at Cross Bay Boulevard in Ozone Park. The IND Fulton Street Line was supposed to be extended farther east into Queens as part of the IND Second System, via an extension of the Fulton Elevated or a new subway. The line would have gone as far as Springfield Boulevard in Queens Village or 229th Street in Cambria Heights, both near the Nassau County border. The line would have also had a spur to the Rockaways. The 1929 Second System plan suggested recapturing and extending the Fulton elevated along Liberty, Brinkerhoff and Hollis Avenues to Springfield Boulevard, near Hempstead Turnpike, Belmont Park, and the Queens Village LIRR Station. The 1939 plan, meanwhile, proposed extending the subway along Pitkin Avenue to Cross Bay Boulevard in South Ozone Park, then along Linden Boulevard to Cambria Heights near the Cross Island Parkway. A spur would have branched off east of Cross Bay Boulevard, turning south to join with the former Rockaway Beach Branch of the Long Island Rail Road (now the IND Rockaway Line). This extended Fulton Street Line would have also facilitated service from the planned Second Avenue Subway via a river tunnel from Lower Manhattan to the then-terminal station at Court Street. 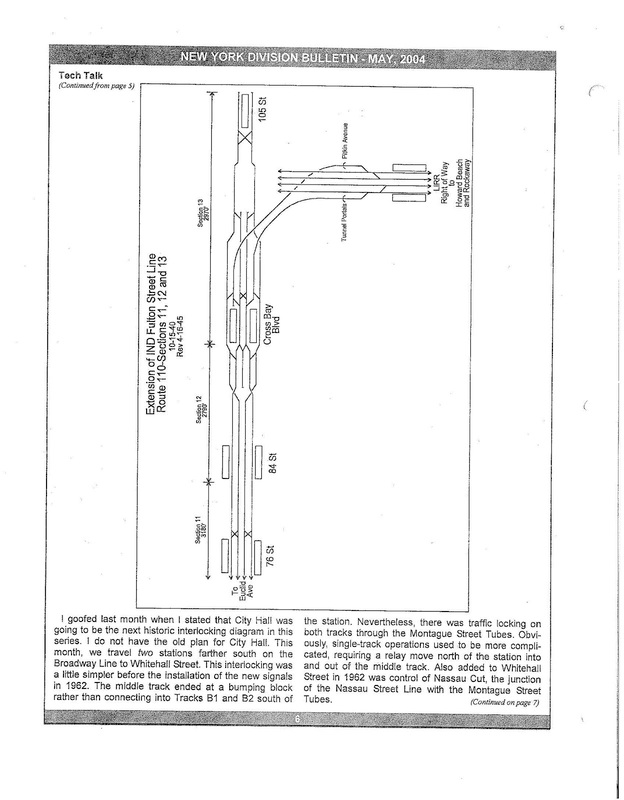 In a 1940 plan, which was revised in 1945, the IND Fulton Street Line would connect to the IND Rockaway Line in a similar manner to the 1939 plan, via an extension of the subway under Pitkin Avenue. The line, east of Euclid Avenue, would be 4 tracks, with local stations at 76th Street and 84th Street, and an express station at Cross Bay Boulevard. At Cross Bay Boulevard, a flying junction would let the local tracks cross over to the inside and the express tracks cross over to the outside. The layout would be similar to that of Manhattan's 168th Street station. East of Cross Bay Boulevard, another flying junction would bring a two-track branch over the line to a pair of portals north of Aqueduct – North Conduit Avenue station. Meanwhile, the Fulton Street Line's four tracks would merge into two tracks, and end at 105th Street (today's Aqueduct Racetrack), where a scissors crossover would be present just west of the station. Crossovers would also be located between the local and express pair of tracks east of 76th Street, and between the two express tracks east of Cross Bay Boulevard. Currently the line ends at Lefferts Boulevard in Ozone Park (the former end of the Fulton El), and only the Rockaway extension was completed. The mainline tracks that go past the Euclid Avenue station were to be part of a 4-track line to Cambria Heights. ^ a b c d e Sparberg, Andrew J. (October 2014). From a Nickel to a Token: The Journey from Board of Transportation to MTA. Fordham University Press. ISBN 978-0-8232-6190-1. ^ a b c d e f g h i j Raskin, Joseph B. (2013). The Routes Not Taken: A Trip Through New York City's Unbuilt Subway System. New York, New York: Fordham University Press. ISBN 978-0-82325-369-2. ^ a b c d e "First Leg of Rockaways Transit Opened at Cost of $10,154,702" (PDF). nytimes.com. The New York Times. April 30, 1956. Retrieved June 29, 2015. ^ "MTA Neighborhood Maps: Woodhaven" (PDF). mta.info. Metropolitan Transportation Authority. 2018. Retrieved October 1, 2018. ^ a b c d Freeman, Ira Henry (June 28, 1956). "Rockaway Trains to Operate Today" (PDF). nytimes.com. The New York Times. Retrieved June 29, 2015. ^ a b c Duffus, R.L. (September 22, 1929). "OUR GREAT SUBWAY NETWORK SPREADS WIDER; New Plans of Board of Transportation Involve the Building of More Than One Hundred Miles of Additional Rapid Transit Routes for New York" (PDF). The New York Times. Retrieved August 19, 2015. ^ a b c d e "Trains Roll on $47,000,000 Fulton St. Subway Extension". Brooklyn Daily Eagle. November 29, 1948. p. 2. Retrieved October 9, 2015 – via Newspapers.com. ^ "NEW SUBWAY LINK OPENED BY MAYOR; He Tells 15,000 in Brooklyn It Will Be Extended to Queens When Red Tape Is Cut". The New York Times. April 9, 1936. ISSN 0362-4331. Retrieved August 15, 2016. ^ a b c Linder, Bernard (February 2006). "Fulton Street Subway". New York Division Bulletin. Electric Railroader's Association. 49 (2): 2. Retrieved August 27, 2016. ^ "Subway Contract Given to Boro Firm". Brooklyn Daily Eagle. September 12, 1940. p. 2. Retrieved August 27, 2016 – via Newspapers.com. ^ a b Blauvelt, Paul (June 9, 1946). "Shortages Snarl $50,000,000 Tube Links". Brooklyn Daily Eagle. p. 21. Retrieved October 9, 2015 – via Newspapers.com. ^ Kramer, Frederick A. (1990). Building the Independent Subway. Quadrant Press. ISBN 9780915276509. ^ Foley, A.J. (1946). "Sign for the Closing of the Court Street Station, 1946 ; IND Crosstown Line". New York Transit Museum. Retrieved August 28, 2016. ^ a b Report for the three and one-half years ending June 30, 1949. New York City Board of Transportation. 1949. ^ "Last Word in Subways and Cars for Boro". Brooklyn Daily Eagle. November 23, 1948. p. 8. Retrieved October 9, 2015 – via Newspapers.com. ^ "IND Faster Service Will Start Sunday" (PDF). New York Times. October 20, 1949. Retrieved February 20, 2016. ^ "Improving Subway Service". New York Daily News. October 1, 1949. Retrieved November 5, 2018. ^ Bennett, Charles G. (November 20, 1949). "Transit Platforms on Lines in Queens to be Lengthened" (PDF). The New York Times. Retrieved July 16, 2016. ^ Noonan, Dan (March 6, 1951). "Transit Board to Add 1 Car to Fulton St. IND Trains: 11-Car Units Will East Rush Hour Jam in Boro". Brooklyn Daily Eagle. p. 5. Retrieved July 16, 2016 – via Newspapers.com. ^ "Cashmore Hails Slum Clearance in Downtown Section". Brooklyn Eagle. Fultonhistory.com. October 16, 1952. p. 10. Retrieved August 15, 2016. ^ Noonan, Dan (August 13, 1954). "Asks Funds for New Boro Criminal Courts Building: Plan To Construct It at Smith and Atlantic". Brooklyn Eagle. Fultonhistory.com. Retrieved August 15, 2016. ^ "$7,000,000 Signal Job To Be Let In February: City Approves $1,000,000 Contracts For Station And Sub-Station in Broad Channel And For The Rehabilitation Of The Liberty Avenue Line". Wave of Long Island. Fultonhistory.com. December 23, 1954. p. 1. Retrieved July 22, 2016. ^ "$7,000,000 Signal Job To Be Let In February: City Approves $1,000,000 Contracts For Station And Sub-Station in Broad Channel And For The Rehabilitation Of The Liberty Avenue Line" (PDF). Wave of Long Island. Fultonhistory.com. December 23, 1954. p. 7. Retrieved July 22, 2016. ^ "Architectural Rendering of Grant Avenue Control Building: IND Fulton Line". New York Transit Museum. August 11, 1954. Retrieved August 25, 2016. ^ "First Train On Rockaway Line Runs This Afternoon". Wave of Long Island. Fultonhistory.com. June 28, 1956. p. 1. Retrieved August 16, 2016. ^ "First Train On Rockaway Line Runs This Afternoon". Wave of Long Island. Fultonhistory.com. June 28, 1956. p. 6. Retrieved August 16, 2016. ^ "TA's New Line To Rockaways Begins Today: Fifty Piece Band To Play as Special Train Makes First Run". The Leader-Observer. Fultonhistory.com. June 28, 1956. p. 1. Retrieved August 16, 2016. ^ "To Rockaways: Beach Trains In Operation". Greenpoint Weekly Star. Fultonhistory.com. June 29, 1956. p. 2. Retrieved August 16, 2016. ^ Berger, Paul (April 3, 2018). "New York Subway Cuts Back Plans to Renovate Stations". Wall Street Journal. ISSN 0099-9660. Retrieved April 3, 2018. ^ a b c Roger P. Roess; Gene Sansone (August 23, 2012). The Wheels That Drove New York: A History of the New York City Transit System. Springer Science & Business Media. pp. 416–417. ISBN 978-3-642-30484-2. ^ a b c d e f "New Elevated Line Opened for Queens" (PDF). The New York Times. September 26, 1915. Retrieved September 28, 2007. This page was last edited on 30 December 2018, at 01:51 (UTC).